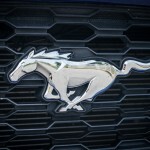 The Mustang represents an incredible value for its price range. 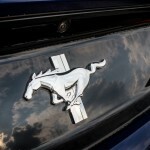 In 1964, Ford introduced the Mustang to great fanfare and strong sales in North America. 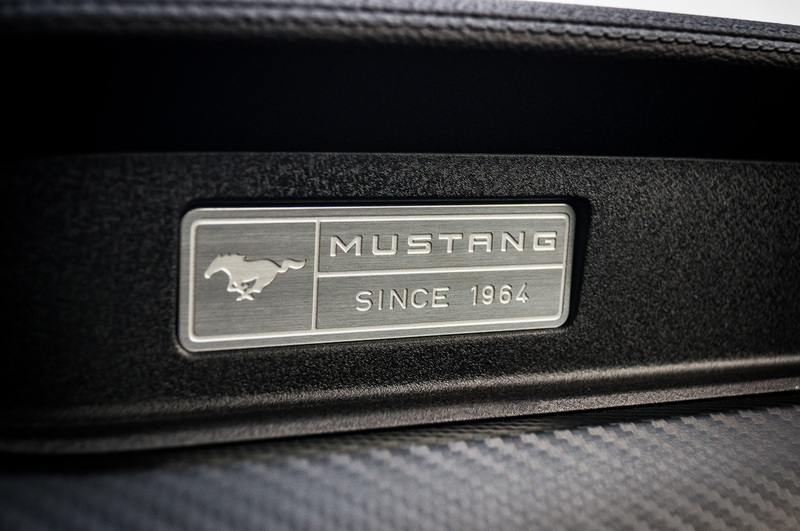 Fifty years later, the sixth generation promises to take the original pony car to new heights in the ever-increasing stakes against its cross-town rivals, the Chevrolet Camaro and the Dodge Challenger. 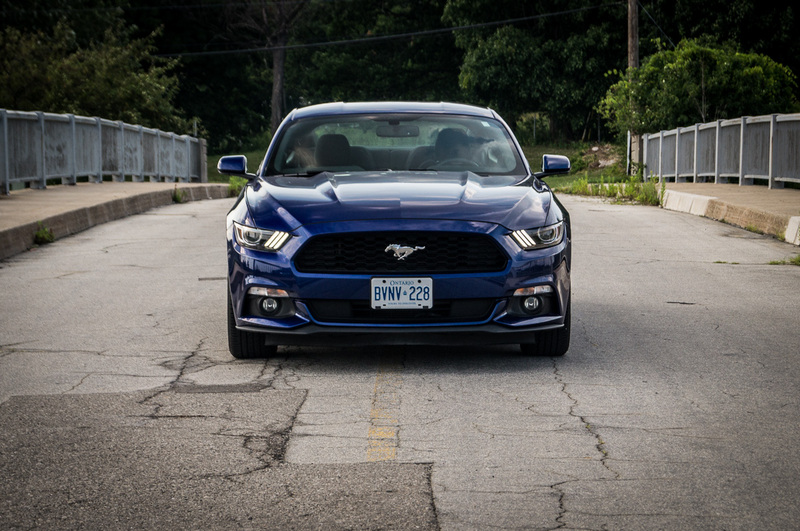 While each vehicle brings its own unique flavour into the mix, the basic formula remains the same: pack a big engine up front, send the power to the back, and give it fast and aggressive styling with two doors. 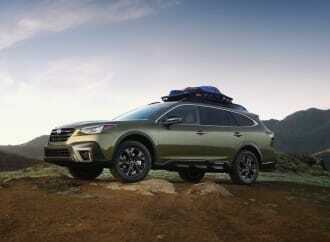 There are always several powertrain options to choose from, ranging between an entry-level V6, a turbocharged four-cylinder, or a fire-breathing, tire-roasting V8. 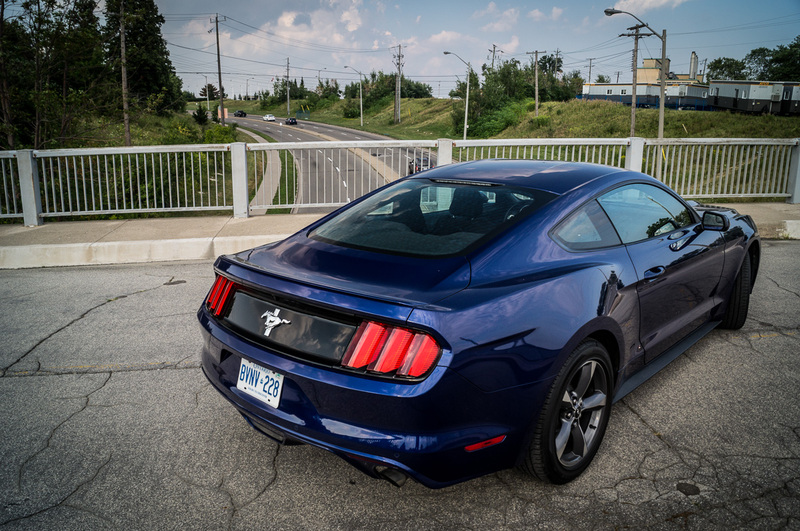 We were handed the keys to a 2015 Ford Mustang V6, finished in Deep Impact Blue, to see what the base models were all about. 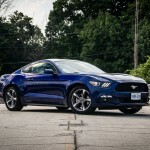 Available in 2+2 coupe or convertible form, the base V6 represents the cheapest way to get into a Mustang. 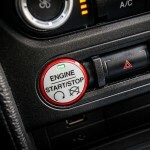 Even so, this hasn’t resulted in a cheapened and de-contented car, both inside and out. 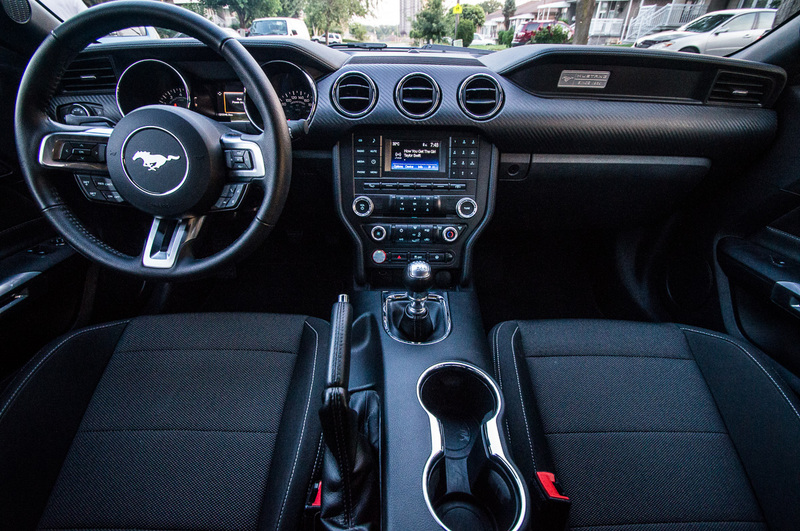 The interior, while full of dark gray, is well constructed with high quality switchgear and good ergonomics. 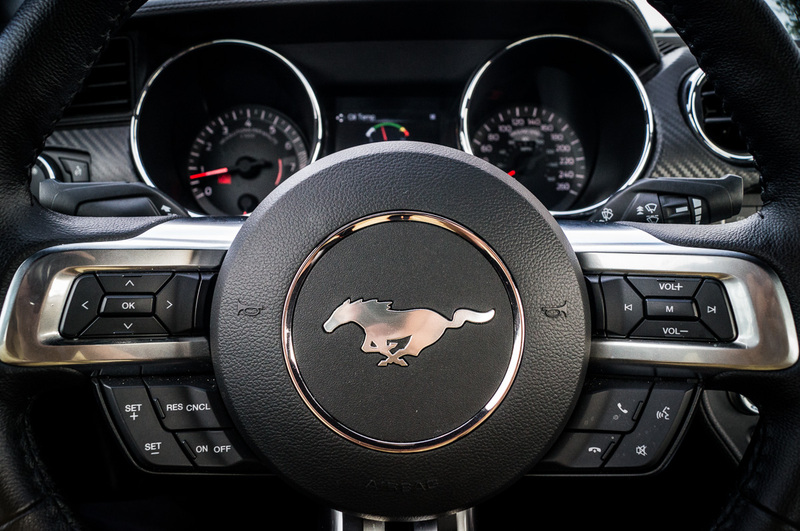 Ford’s SYNC communications and entertainment system makes another appearance, and while controversial in many circles, the non-MyFordTouch version of infotainment is simpler, creating fewer chances for things to go awry. To make selections, the 4.2” screen in the centre stack relies on four radio buttons, combined with four directional buttons. 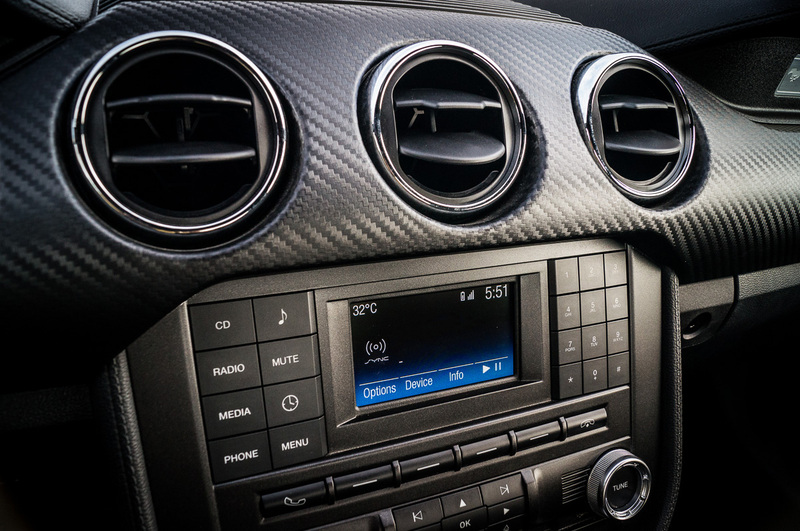 Six speakers provide ample sound quality for most peoples’ needs, and the V6 makes do with single-zone manual climate control. 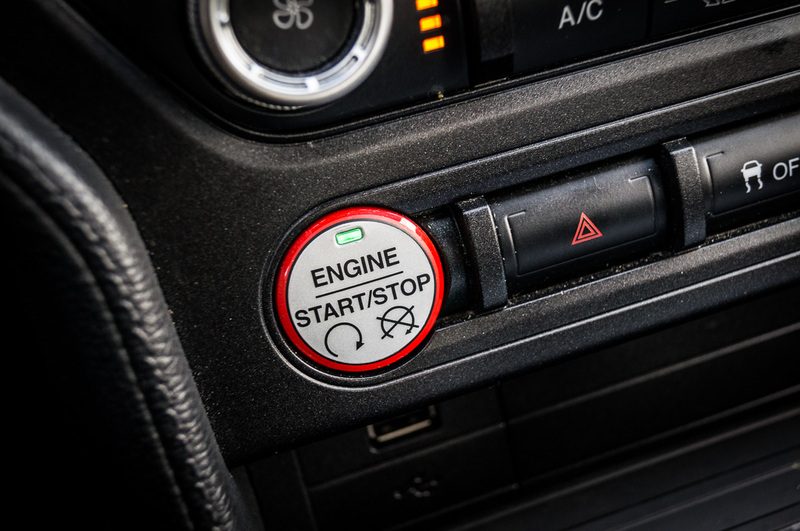 Push-button start with a proximity key and a six-way power driver’s seat round out the mix. 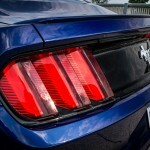 Outside, the Mustang receives aggressive styling that follows the latest Ford corporate design language. 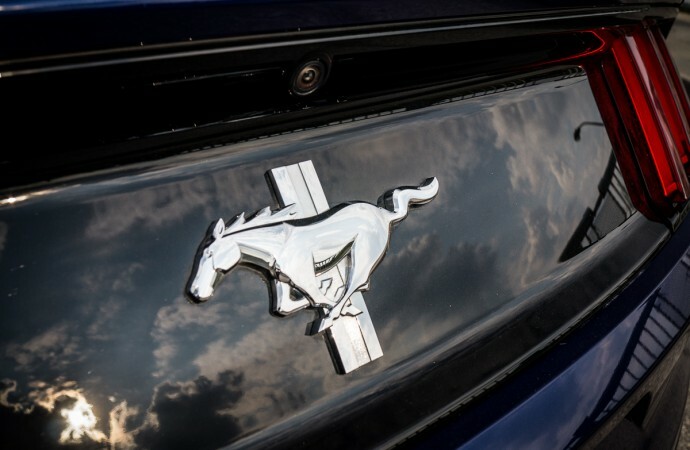 While many commonalities exist between cars like the Focus or Fusion, the Mustang manages to set itself apart with respectful homage to Mustangs of the past. 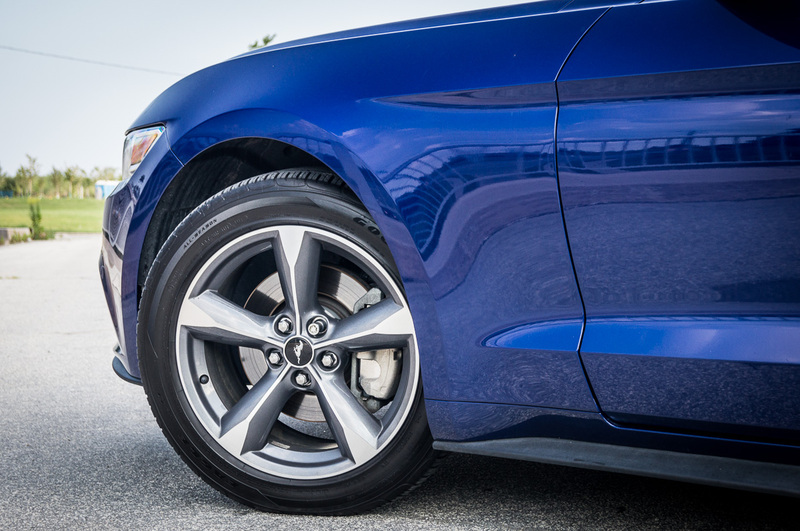 When equipped with the Equipment Group 051A package, a subtle rear spoiler is added, along with very sharp 18” Foundry Black painted aluminum alloy wheels. 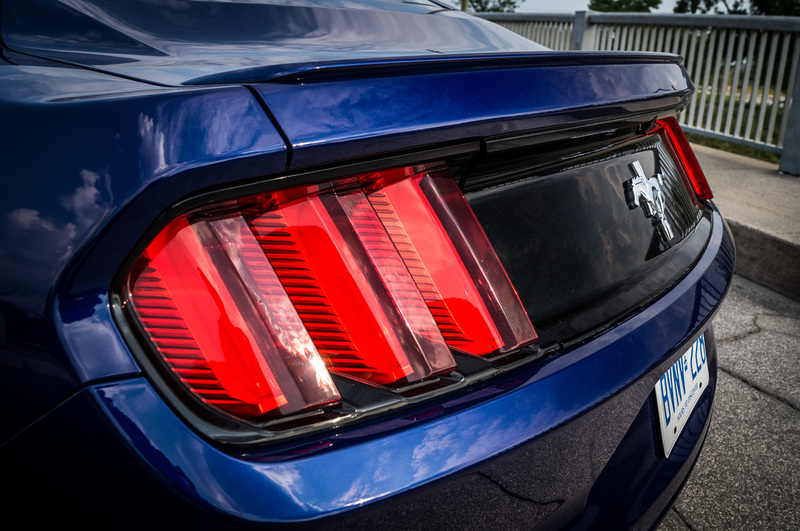 For all trims, the retro fastback styling is rounded out with fog lamps, high intensity discharge (HID) projector headlights, and the conversation-piece LED sequential turn signals. 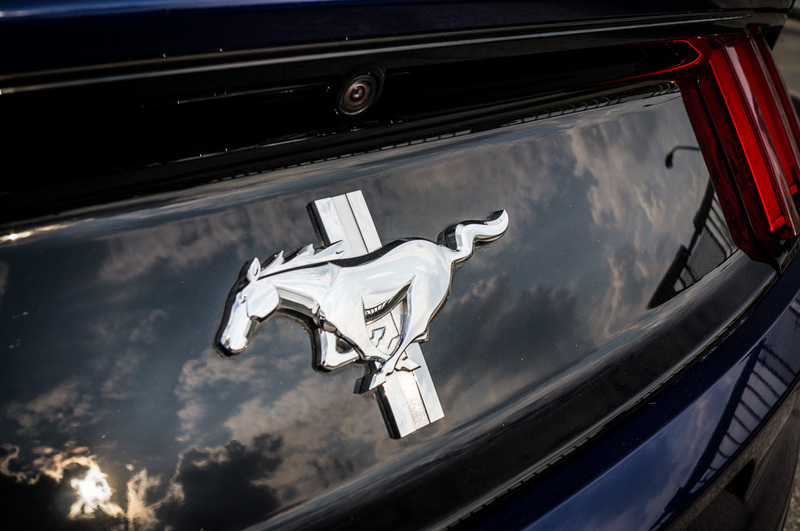 Unlike Mustangs of generations past, going with the cheapest model no longer means being saddled in the penalty box when it comes to powertrain. 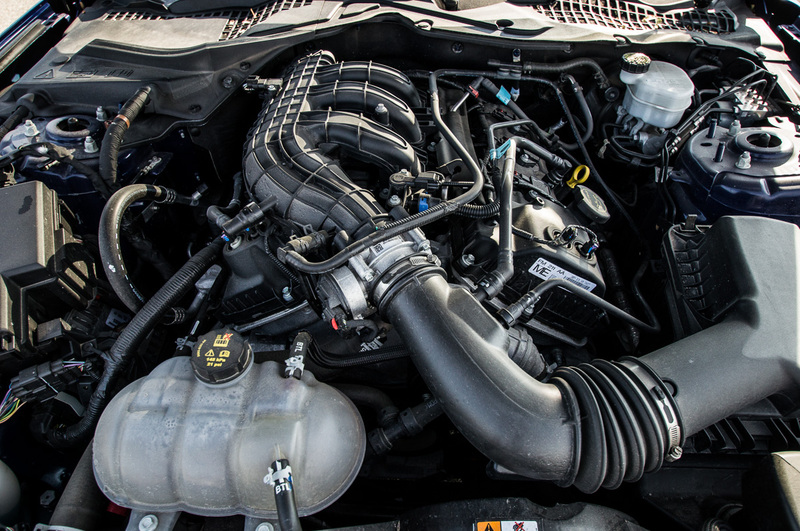 The twin-cam, variable cam timing 3.7L Ti-VCT V6 is good for 300 horsepower @ 6,500 rpm, and 280 lb-ft of torque at 4,000 rpm. 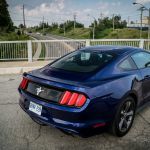 This rivals the output of a V8-equipped GT Mustang from as recently as five years ago – which means that the Mustang V6 is no slouch. The engine is smooth and willing to rev, and never feels out of breath when the going gets tough. While it doesn’t quite provide the soundtrack of the beastly 435-hp 5.0L V8, the 3.7L lets out a masculine snarl that will satisfy most drivers, particularly above 4,000 rpm. 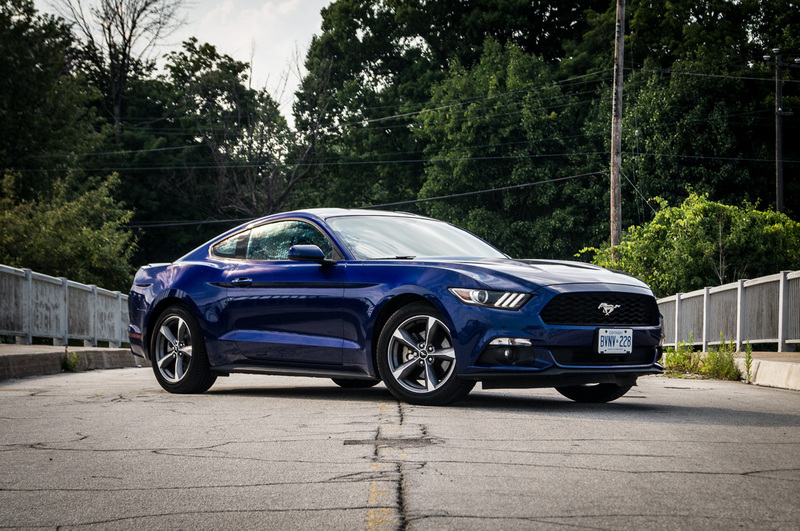 Compared to the latest contender in the Mustang powertrain stable – the 2.3L EcoBoost turbo four cylinder – the V6 has slightly lower output than the EcoBoost’s 310-hp, but is smoother sounding and doesn’t feel as coarse through the rev range. 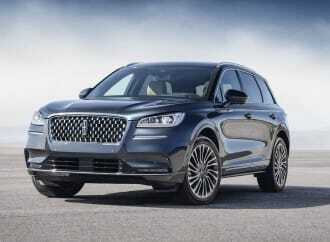 For those looking for a more luxurious and premium feel, the V6 may be for you. 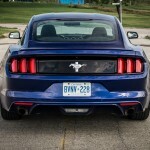 Additionally, the V6 happily accepts regular 87 octane fuel, whereas the EcoBoost recommends premium. 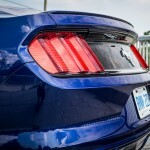 Unfortunately, the V6 is not available with the performance packages that offer larger brakes, wheels, and improved suspension tuning that bring out the most of the Mustang. 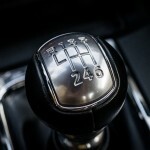 Paired to the V6 is a six-speed manual transmission with great shifter feel. 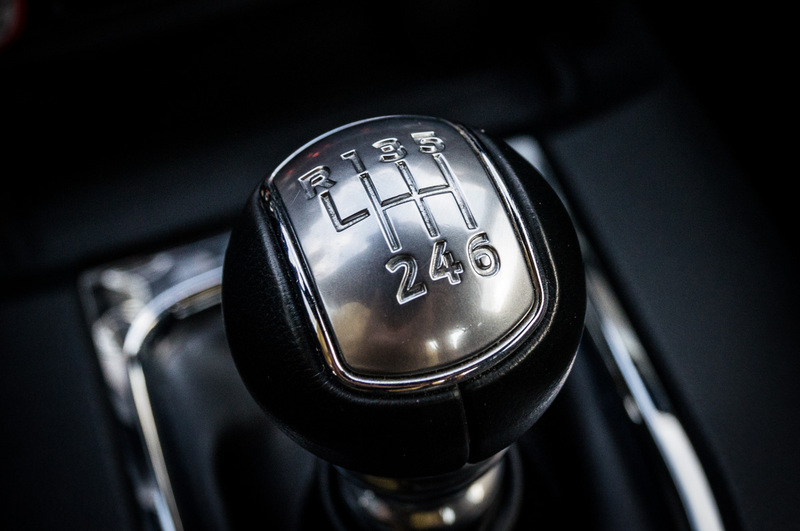 The clutch is easy to modulate with a slightly heavy pedal. 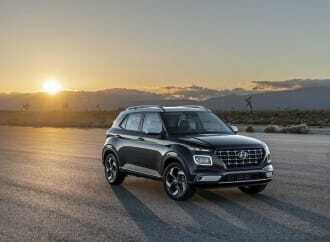 Smooth launches around town are a cakewalk, and things don’t get more difficult when driving spiritedly. 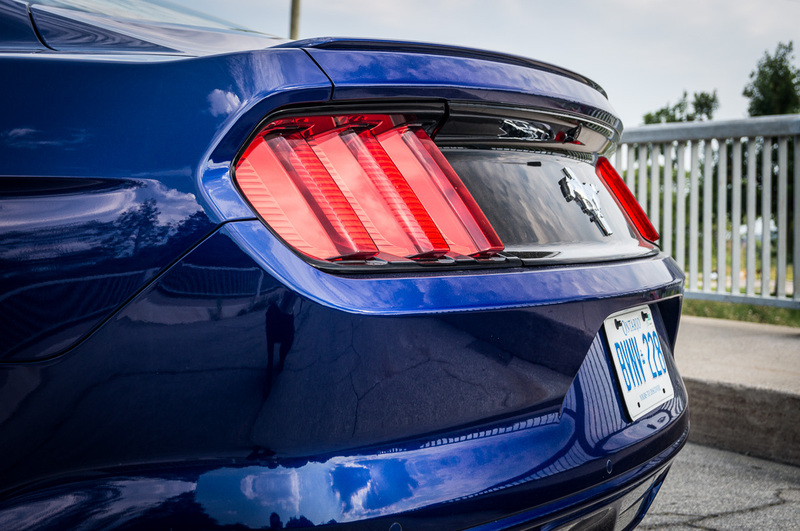 Ford’s drive-by-wire setup is better than many other automakers, with good throttle response during dynamic situations, such as a fast throttle application or a blip during a rev-match downshift operation. 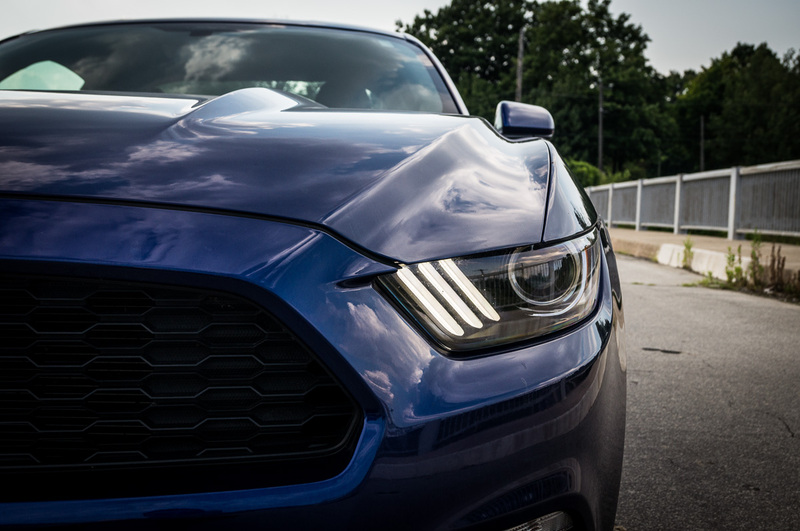 As an unexpected bonus, behind every Mustang is a limited-slip differential, which will aid with traction in all conditions. 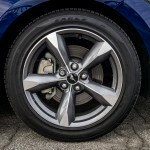 The test car was equipped with the standard 3.15:1 axle ratio. 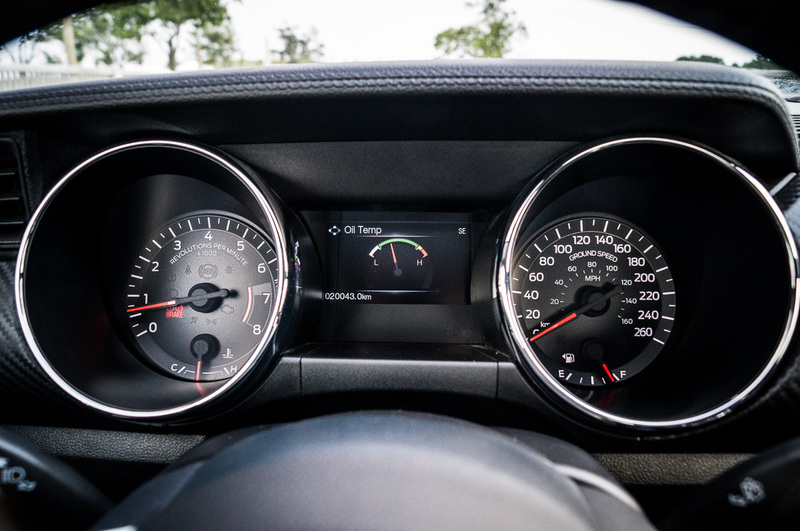 A 3.55:1 ratio is a standalone option independent of any other packages, and should make performance even livelier – but at the expense of some fuel economy, of course. 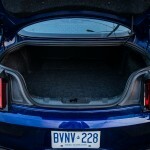 In the suspension department, the single biggest change for the 2015 Ford Mustang is the deletion of the solid rear axle suspension, replaced with an independent setup. 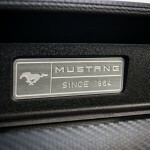 This has resulted in mixed emotions from Mustang enthusiast. The solid axle is hard to beat when handling big power in a straight-line quarter mile launch, but the independent configuration naturally reigns supreme when steering input is required. In any case, a well-designed independent rear suspension can still handle gobs of power without breaking down, and Ford, knowing the intentions of Mustang owners, will have designed their rear end accordingly. 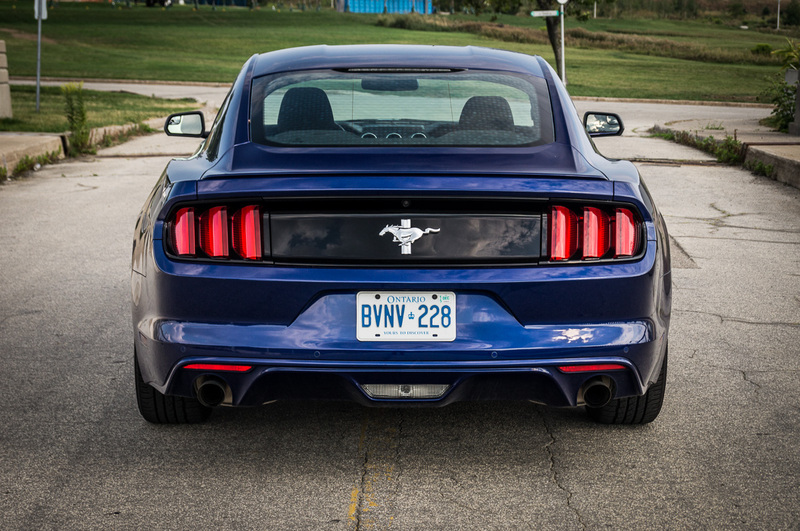 Over the road, the independent rear suspension helps settle the Mustang down on bumpy, twisty roads. 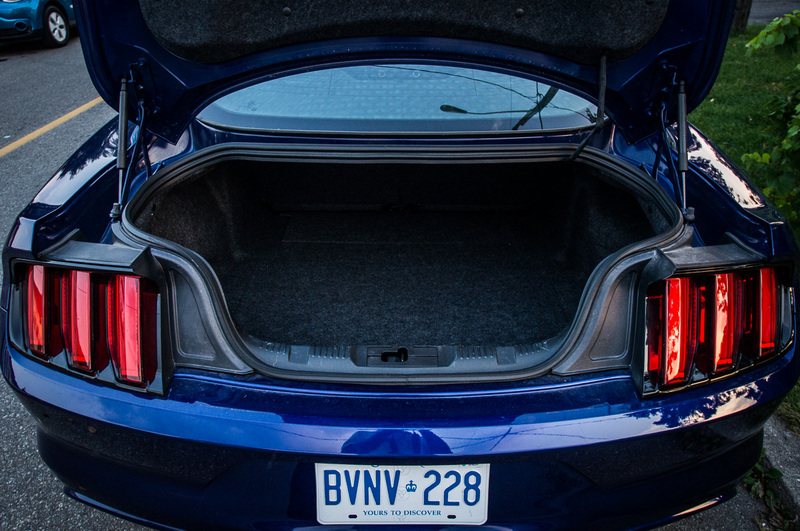 Where the old car would begin to shimmy and skitter, the 2015 Mustang stays planted and lets you power through the corner. 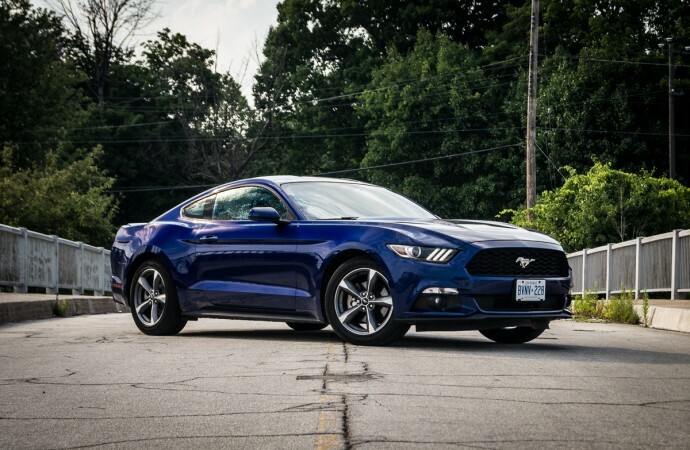 Beyond this, ride quality has not changed significantly compared to the previous Mustang – a stiffer chassis, similar firmness and improved body control mean that the Mustang is fairly entertaining and confidence-inspiring when thrown into a corner. 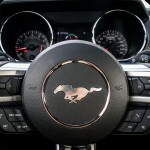 Even so, the Mustang remains comfortable enough to drive every day of the week. 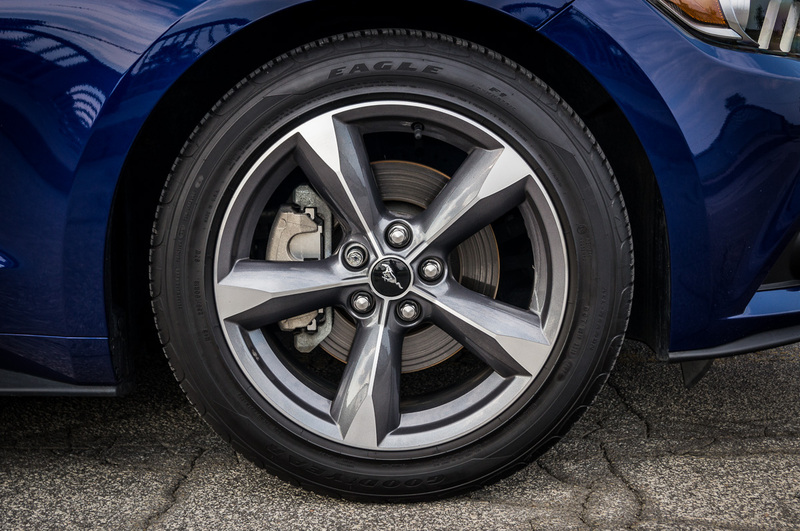 When paired with the 18” aluminum alloy wheels, the 235-section Goodyear performance all-season tires make the Mustang a decent dance partner when at 8/10ths. However, if you push any harder, you begin to feel the need for a more aggressive setup. 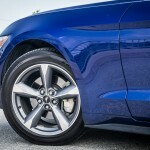 The Premium package available on 2.3L EcoBoost and 5.0L GT models solves this problem with unique chassis tuning, bigger brakes, and stiffer suspension, among other things. 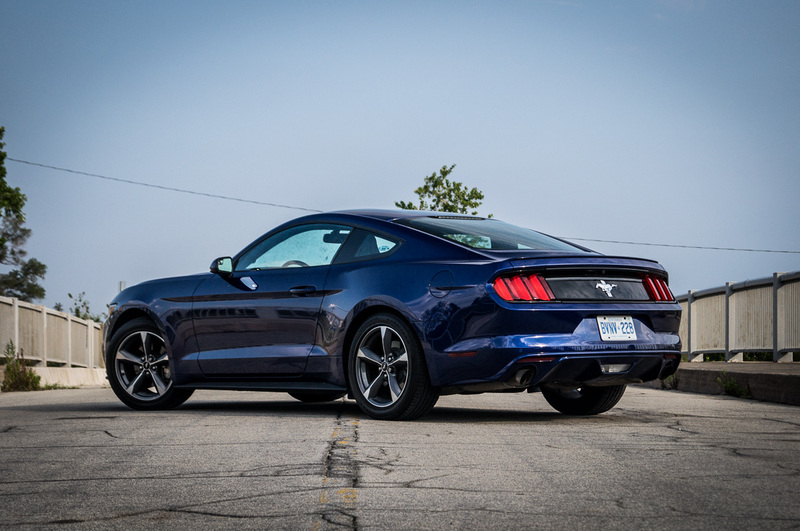 For those seeking fuel economy gains, the 3.7L V6 will be a great choice compared to the 5.0L V8 in the GT trim. 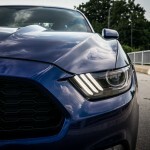 The 2.3L EcoBoost is still the best fuel miser of the group, provided you refrain from driving it with a lead foot. The premium fuel recommendation (not requirement) also hurts the four’s advantage. 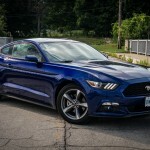 Ford rates the V6 at 13.5 L/100km in the city, and 8.3 L/100km on the highway (the EcoBoost is rated for 10.6 L/100km city and 7.5 L/100km highway). 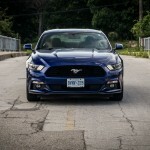 Actual observed test fuel economy was an impressive 9.8 L/100km over 1,000km of mixed driving, which included both the congested streets of Toronto, and the curvy 500-series secondary highways of Eastern Ontario. With an as-tested price of $27,599 before fees, the Mustang represents an incredible value for its price range. 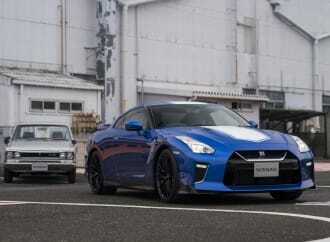 At this price point, the competition includes the likes of the Scion FR-S, Subaru BRZ, and Hyundai Genesis Coupe. 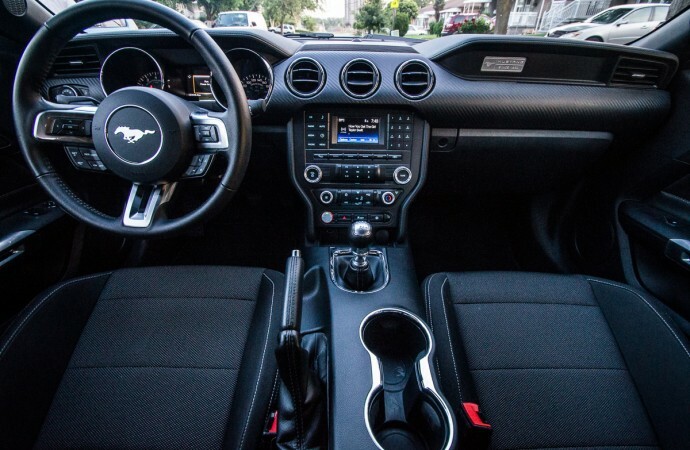 Between all of them, the Mustang comes in with great interior, a laundry list of standard features, and good performance to boot. 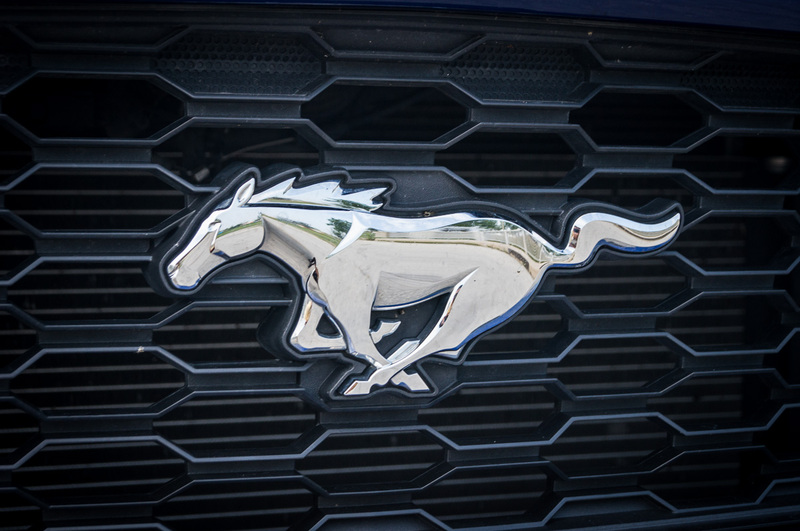 For those looking for a comfortable daily driver with a little extra ground clearance and awesome styling, the Mustang is the ideal option. 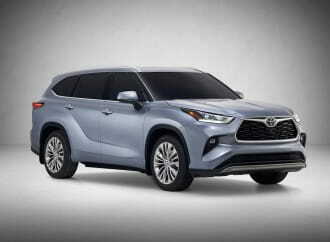 Due to the lack of a performance package, those looking for maximum performance may elect for the Scion, Subaru, or Hyundai. 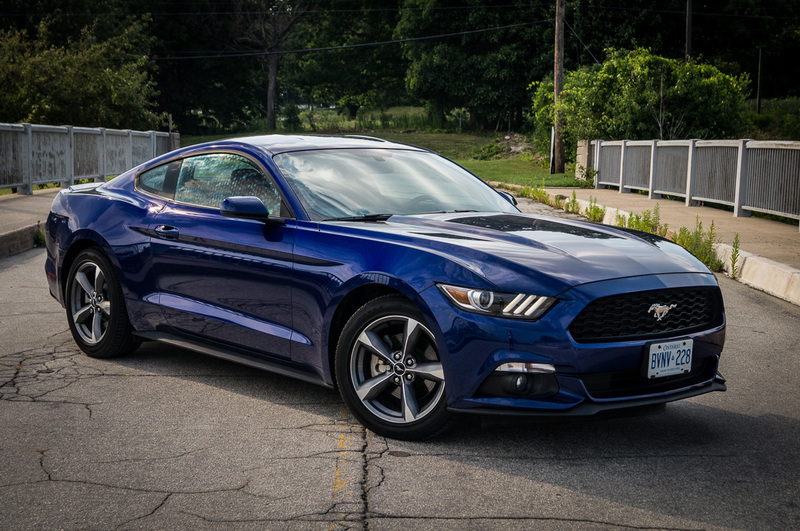 In any case, Ford has done a great job at positioning all Mustangs as a retro-cool coupe that won’t break the bank, while putting a smile on your face, even in the lower powered V6 model.